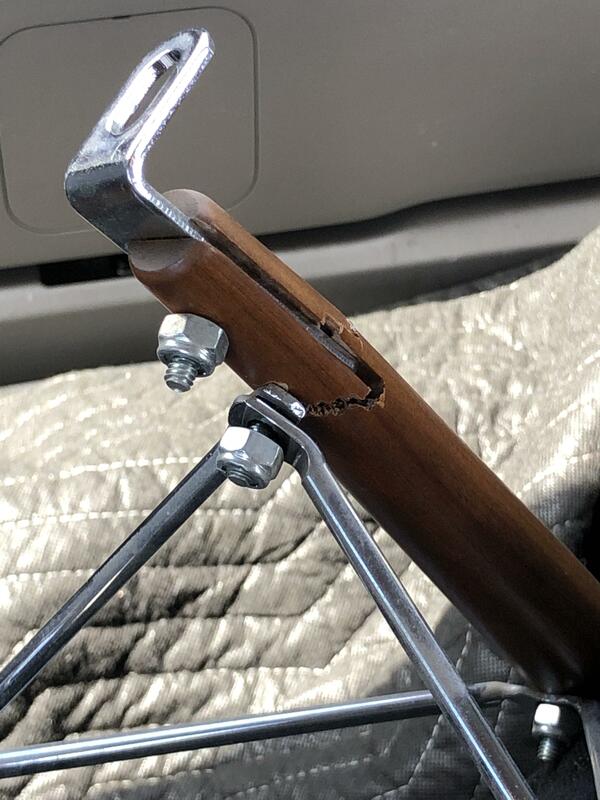 Broken walnut dowel leg. Glue it or replace? 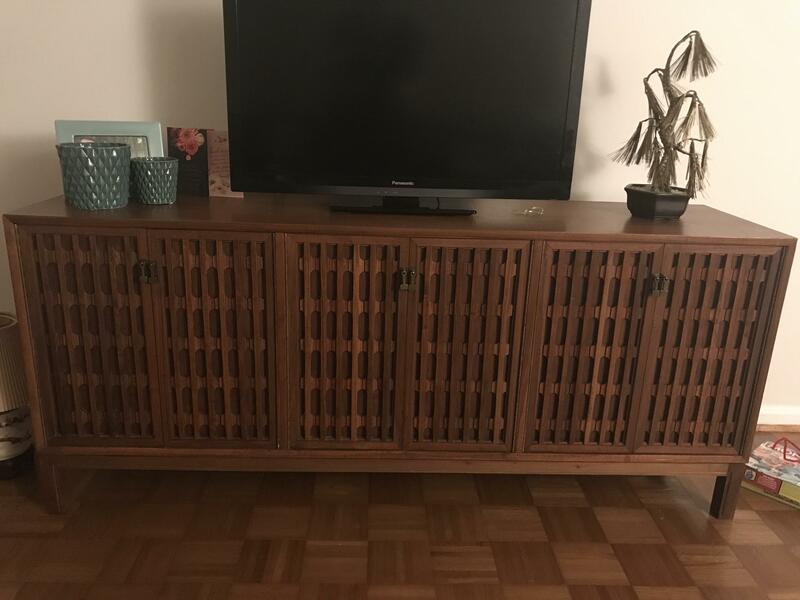 Could anybody identify anything about this Japanese sideboard? Many thanks! 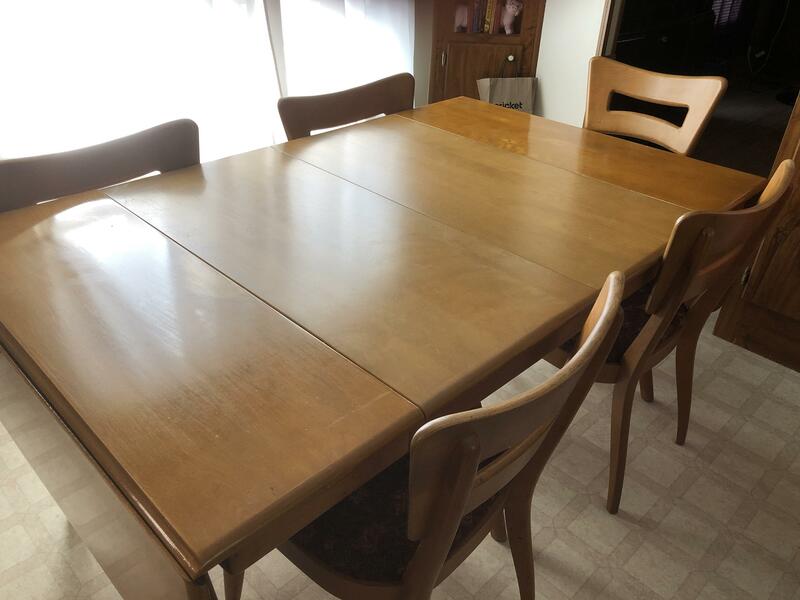 My moms Heywood Wakefield dining table set. 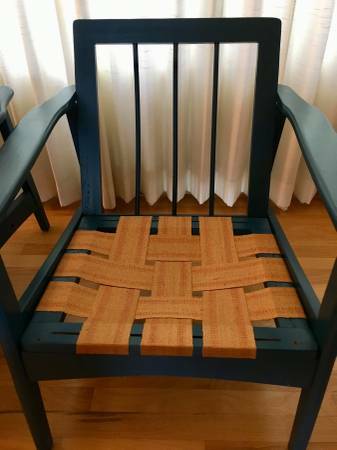 Would you drive an hour for this chair? I’m at a loss for words at so many aspects of this flopped flip. 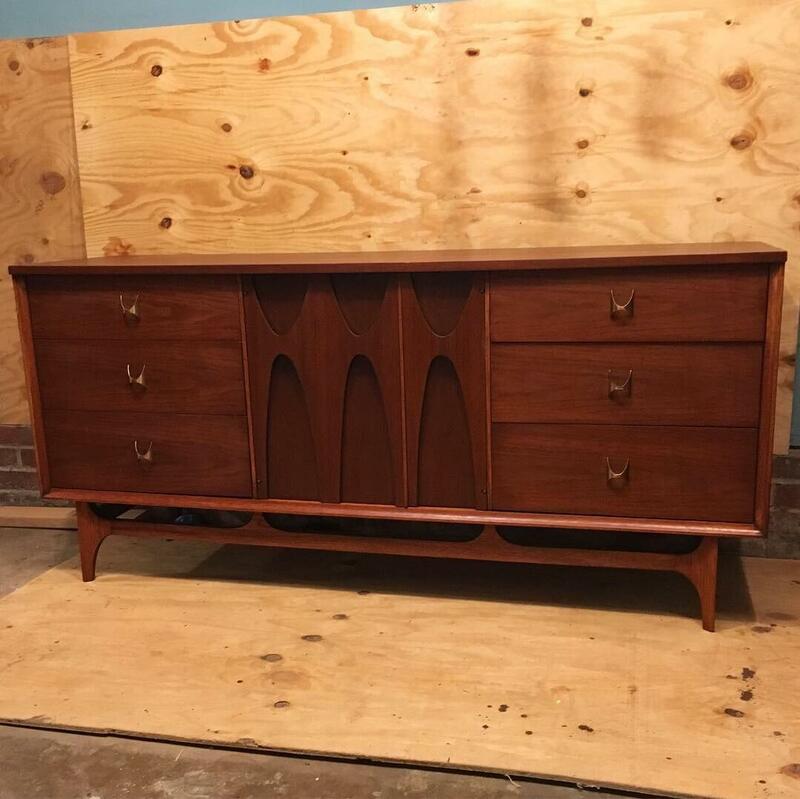 First house purchase is this sideboard cabinet... anyone recognize? 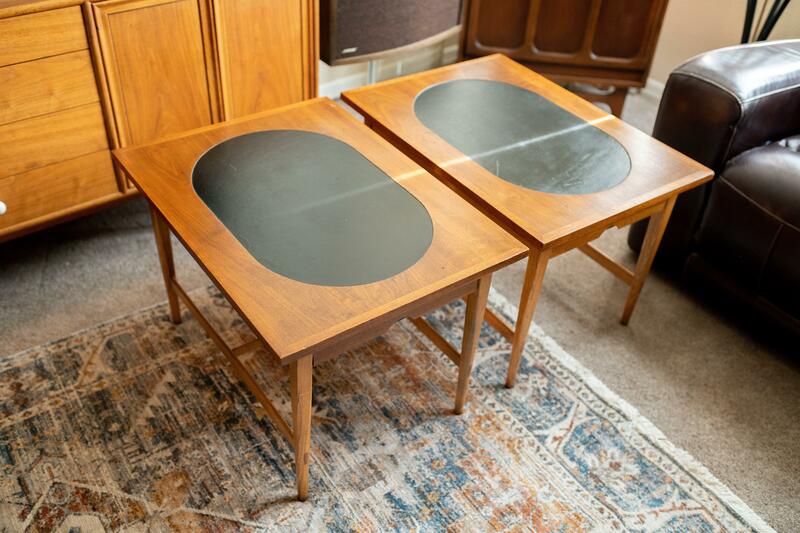 Got this sweet pair of Lane tables with leather oval inlays! Anyone know anything about this line? I’m stumped. I have two of these. How much/where should I sell them? Danish (Farstrup 210?) 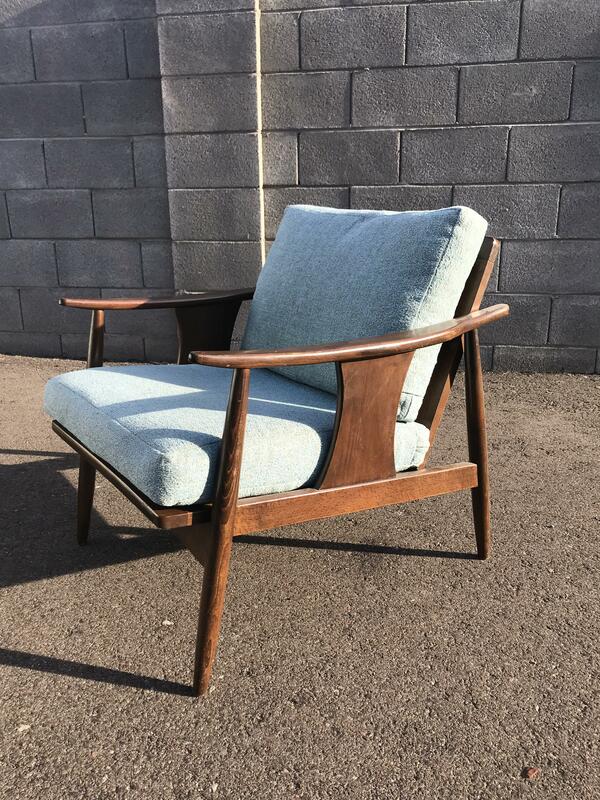 Chair Restoration/Reupholstery Tips? Most recent find! Only marking is white “Japan” underneath. Anyone have an ID or additional info? 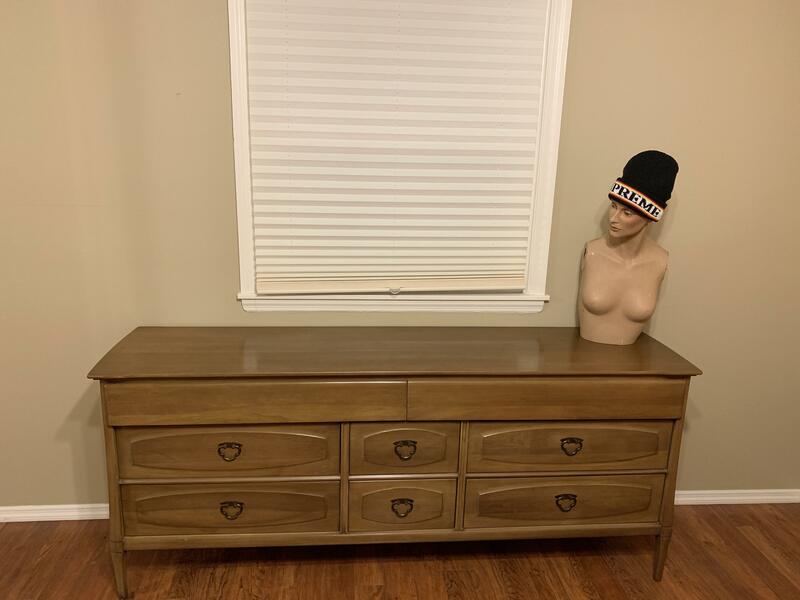 I need help with shipping a large piece. 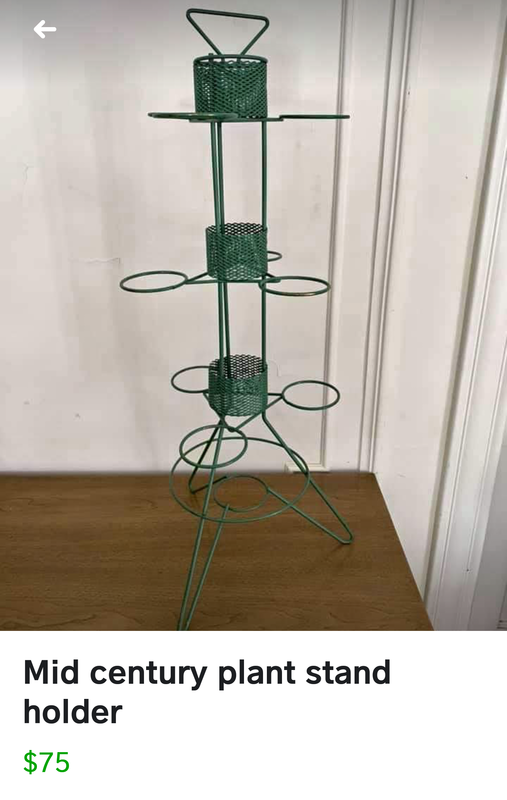 Anyone have an ID on this plant stand? 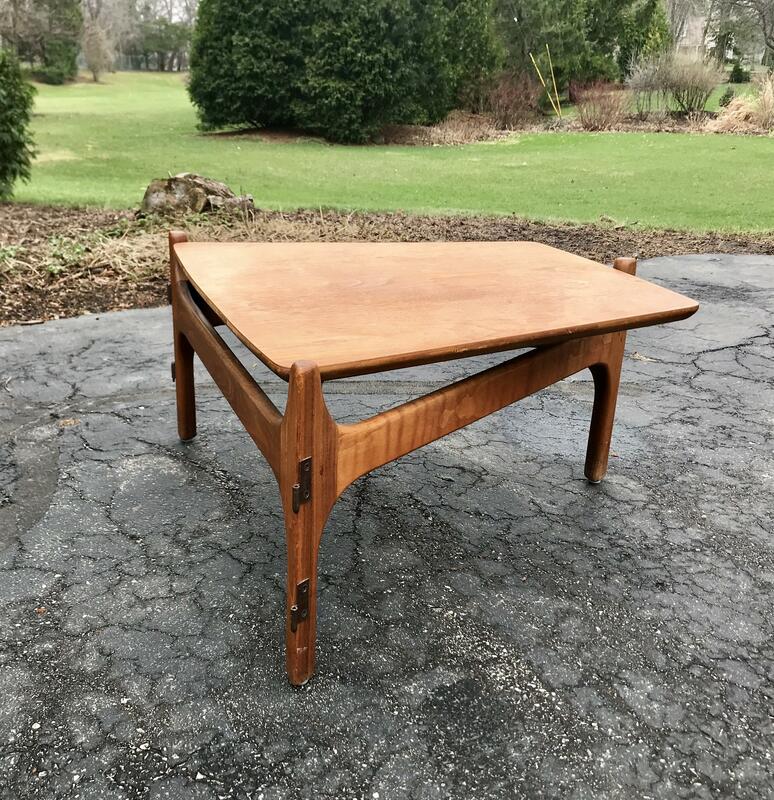 Found this table as is. 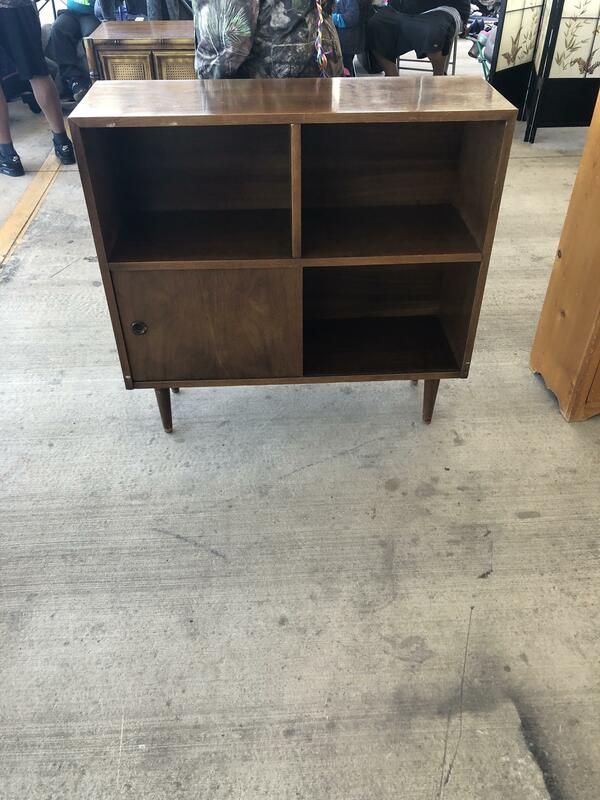 Can anyone tell me why it has those hinges on the legs/provide an ID? Thanks! 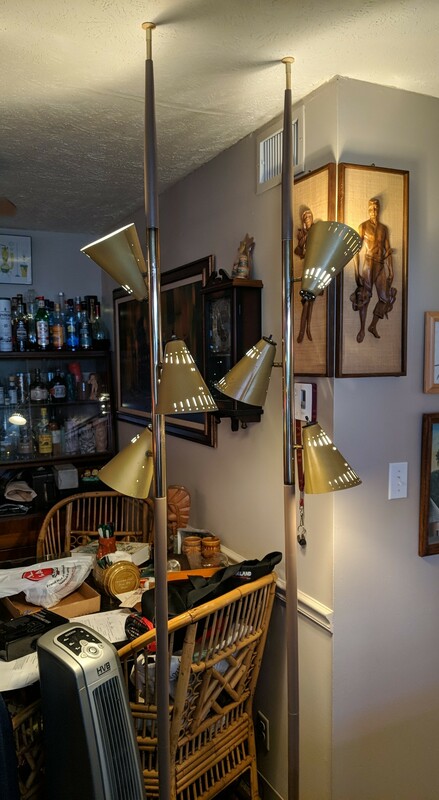 Snagged my 3rd & 4th tension-pole lamps at an estate sale this weekend. Bonus matching pair! 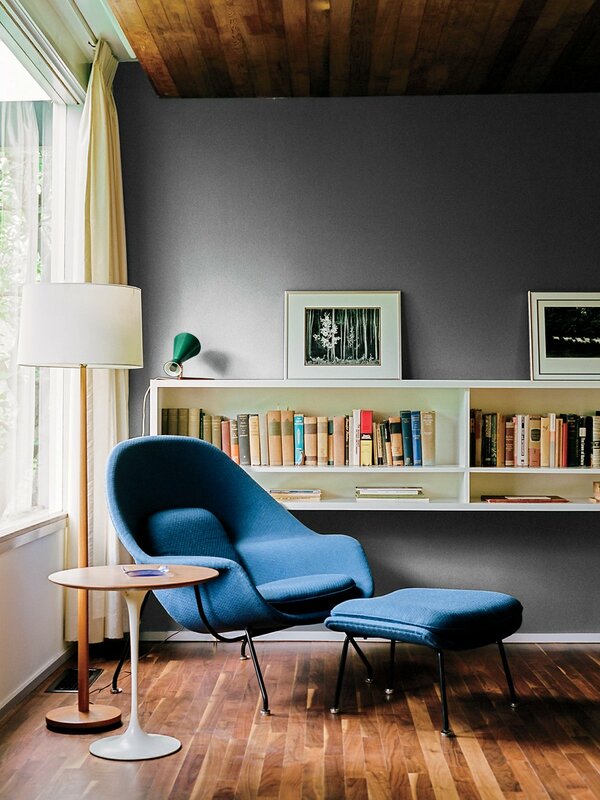 A walnut-topped table and Womb chair, both by Eero Saarinen for Knoll, offer a cozy spot for reading. 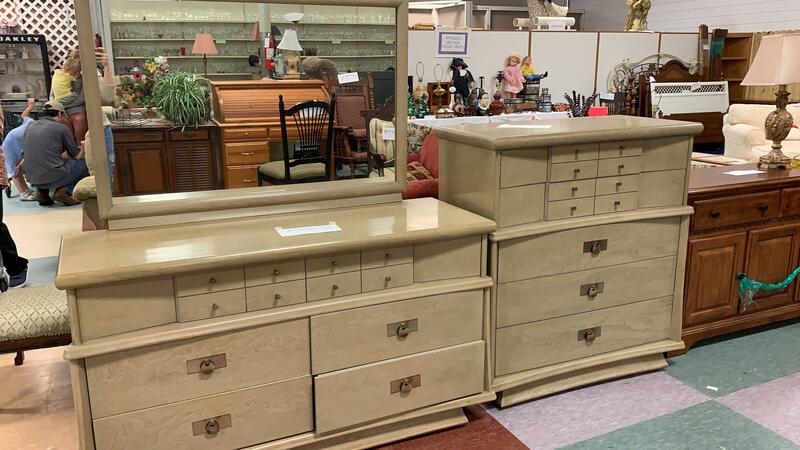 Fun end tables, bar set, and kitchen containers from the Man in the High Castle set sale! 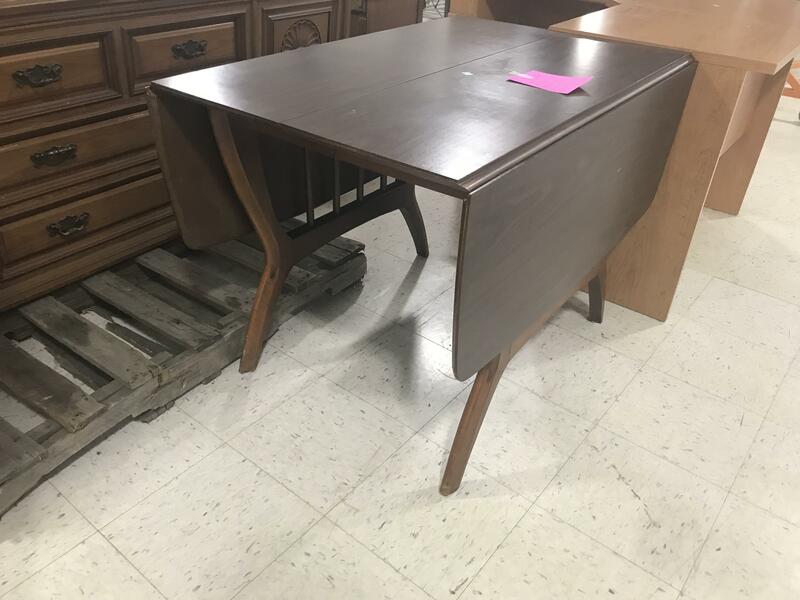 With the intention to flip, should I get this mid century side table? 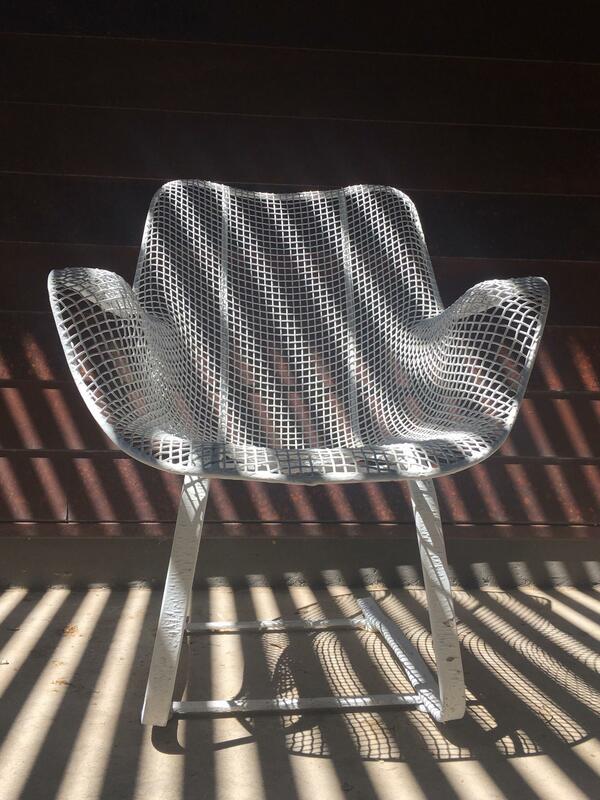 Sculptura Spring Occasional Chair by Russell Woodard. Chair was purchased in early 80’s from The Beverly Hilton. 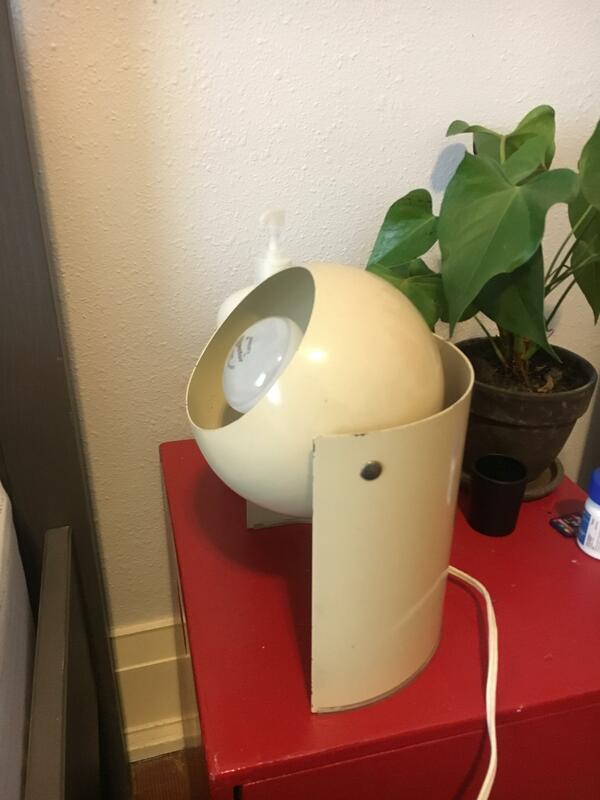 Anyone recognise the age/era of this lamp? From a family cottage in Southern WI built at the turn of the century. It was in the cottage since at least the 70s and we'd love to know more about it now that we have it as a memento (we now live out of state). Plycraft lounge button in tan/green? 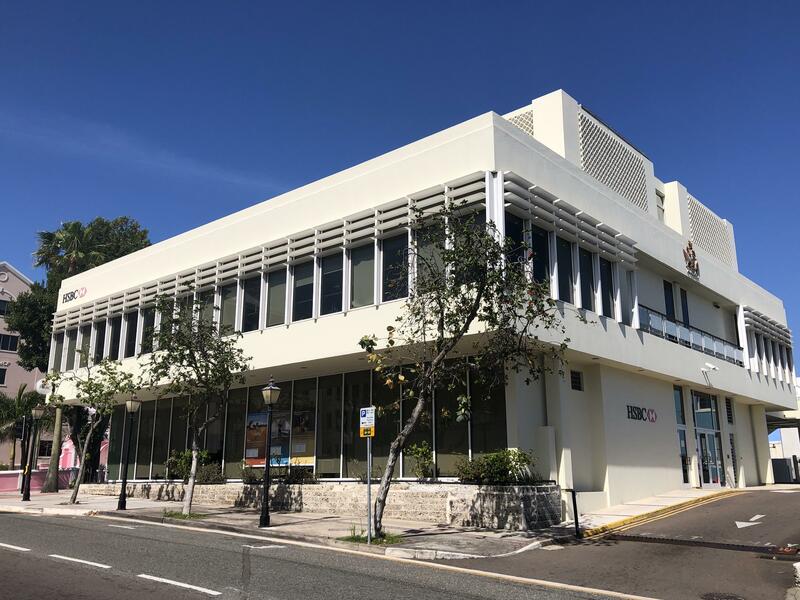 Bermuda has a nice smattering of MCM buildings- here’s a nice clean example of a bank. These are Fred Press. I can't find any with the pink and gold. Paid $4. Any info is appreciated. 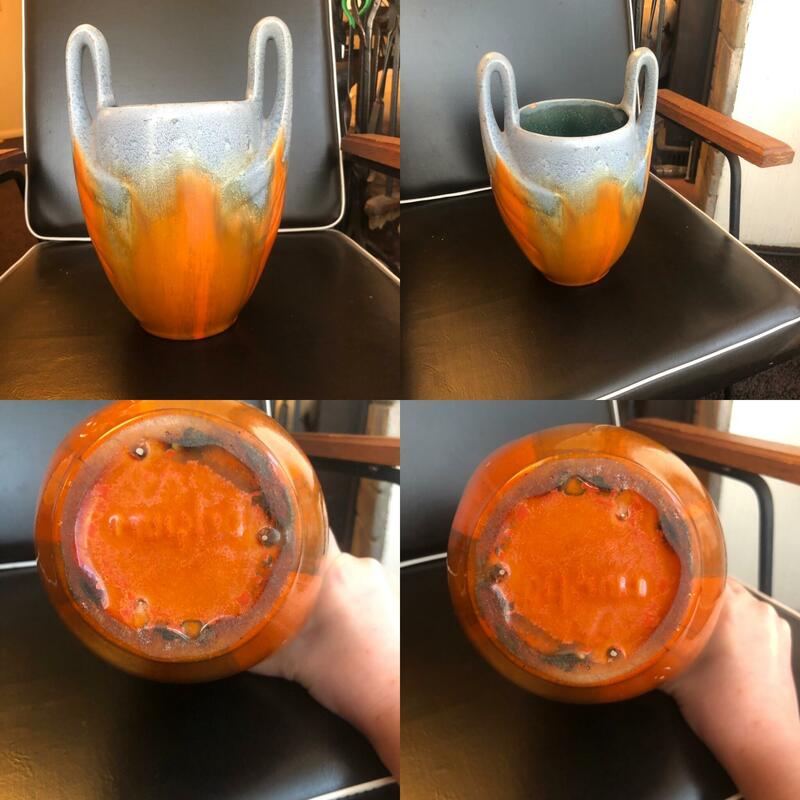 Vase at my mum’s place and needing help to ID! Any ideas? 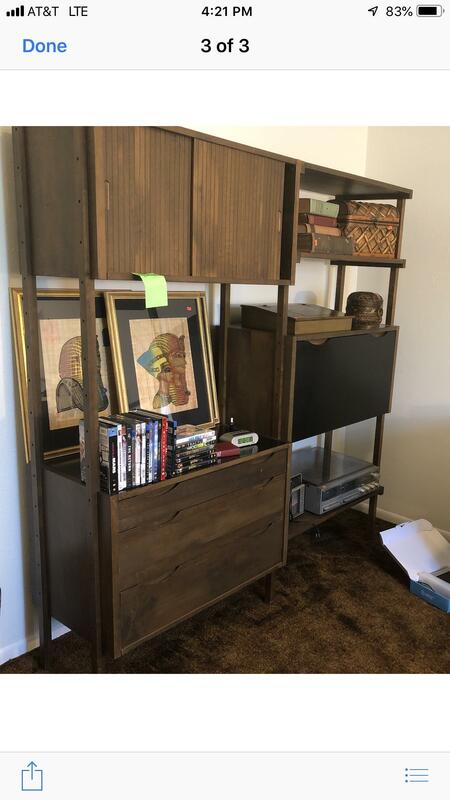 Found this piece on my local Facebook Marketplace, they want $200 for it. 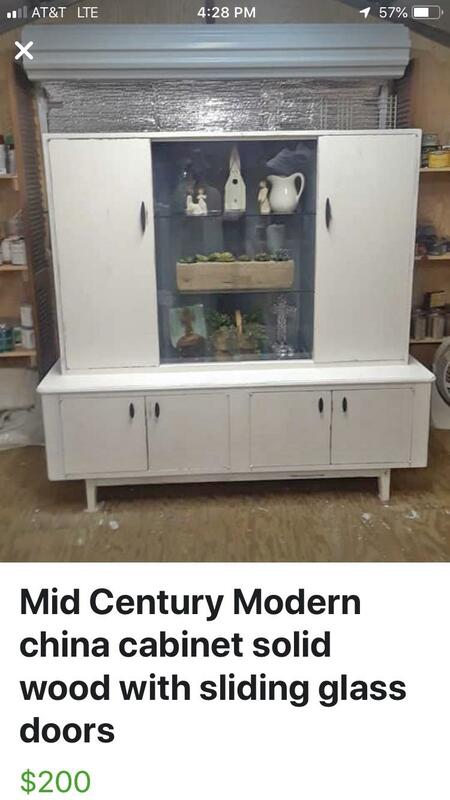 Anyone know if that's a good deal or if its even mid century? Any help would be appreciated. Latest find - can anyone help with an ID? 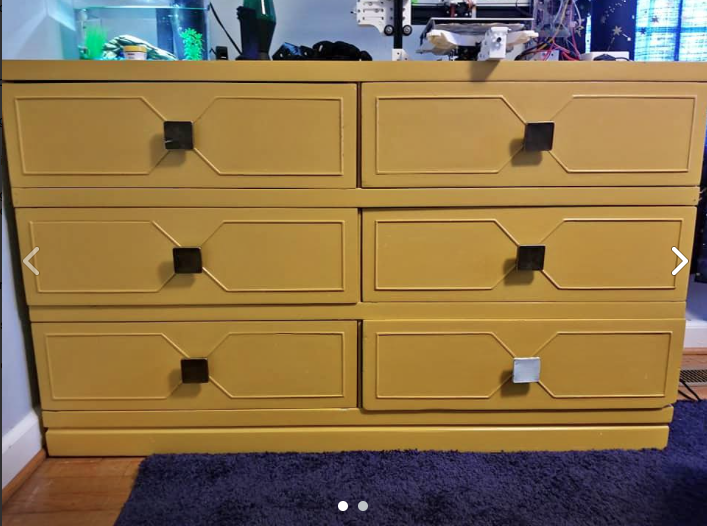 Can’t see any maker stamps but it’s been painted.. It has new webbing, cushions and foam. The armrests have been partially stripped so I’ll pick up where whoever left off and refinish the frame (and get new covers on those cushions). Advice welcome, thanks! 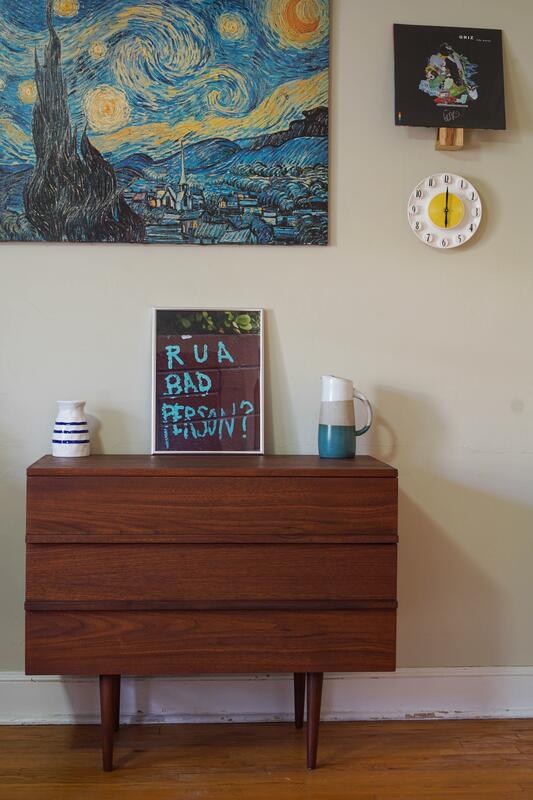 Seven-piece Brasilia find at the local ReStore. 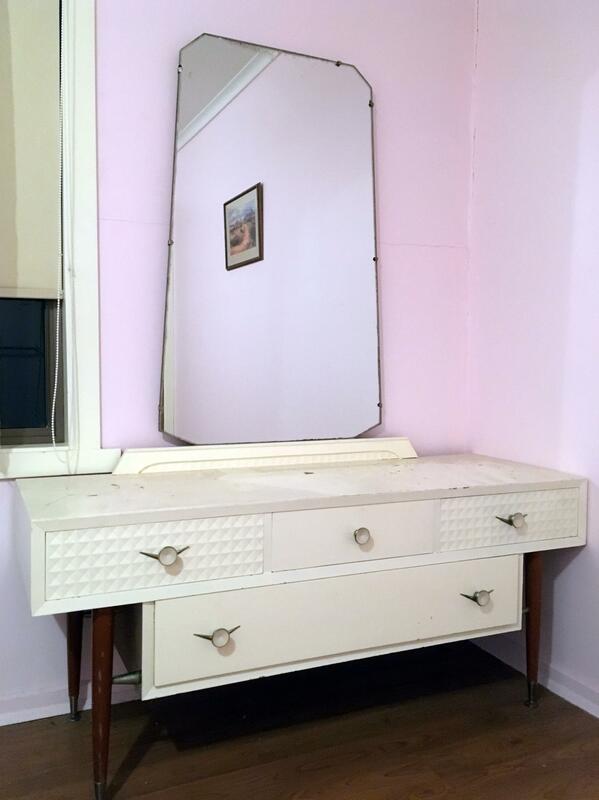 Bought to tidy up and flip, but may have to keep it now that it's home! Just put up my Newgate Pluto Sunburst Clock on the wall to see what it looks like. 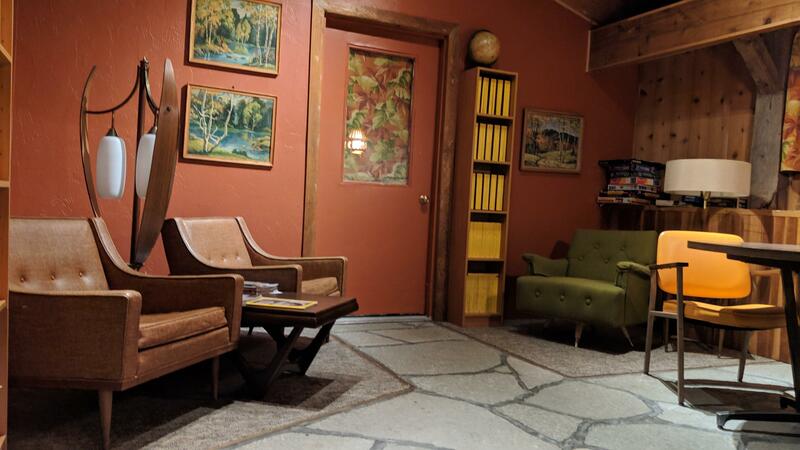 I’m starting decorating on Sunday, but so far looks awesome. 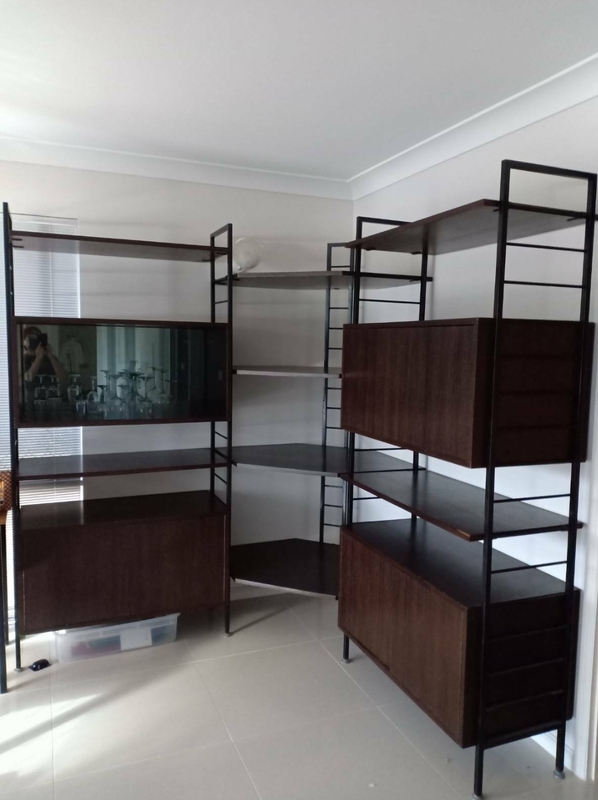 Ladderax or not? How to tell? 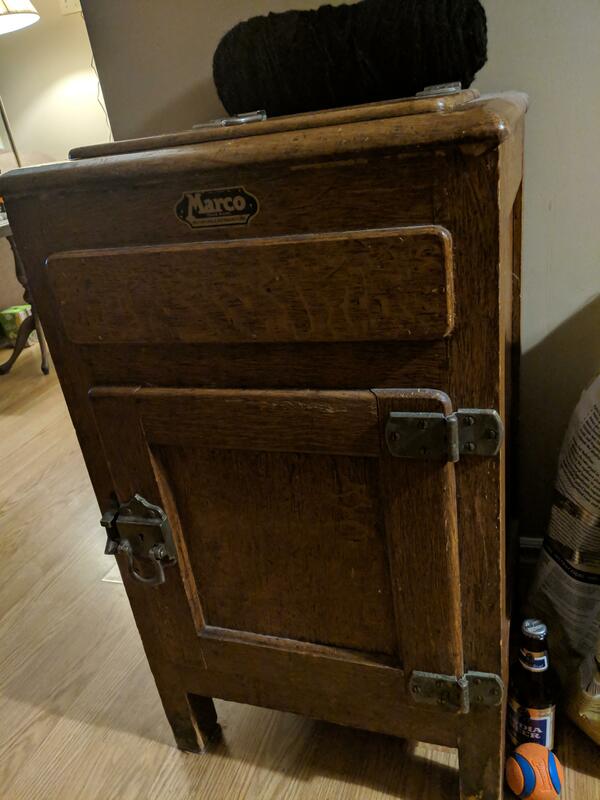 This Marco icebox has been in my parent's house my whole life and I can't find anything out about it. 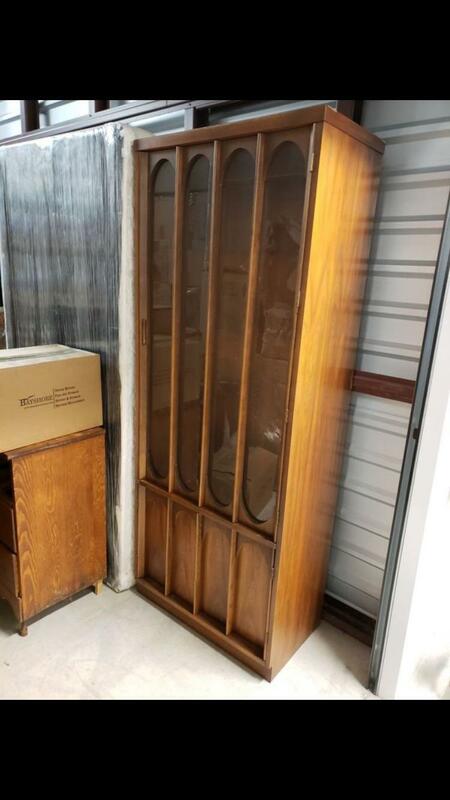 Anyone know anything about it or what it's worth? 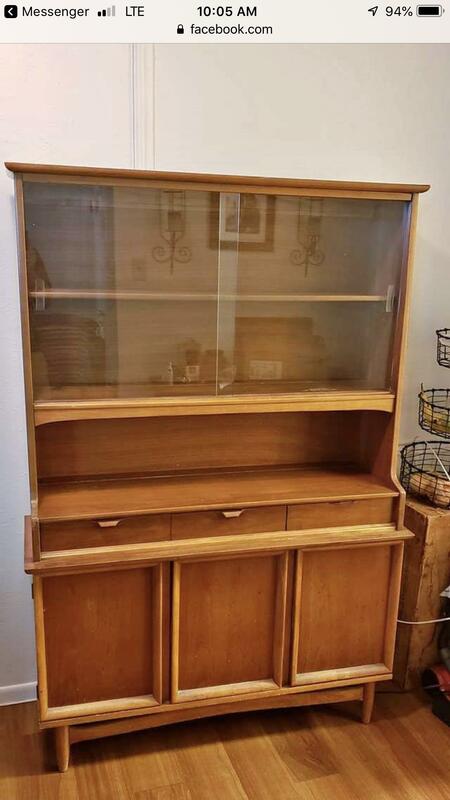 Does anyone recognize this buffet/China cabinet? 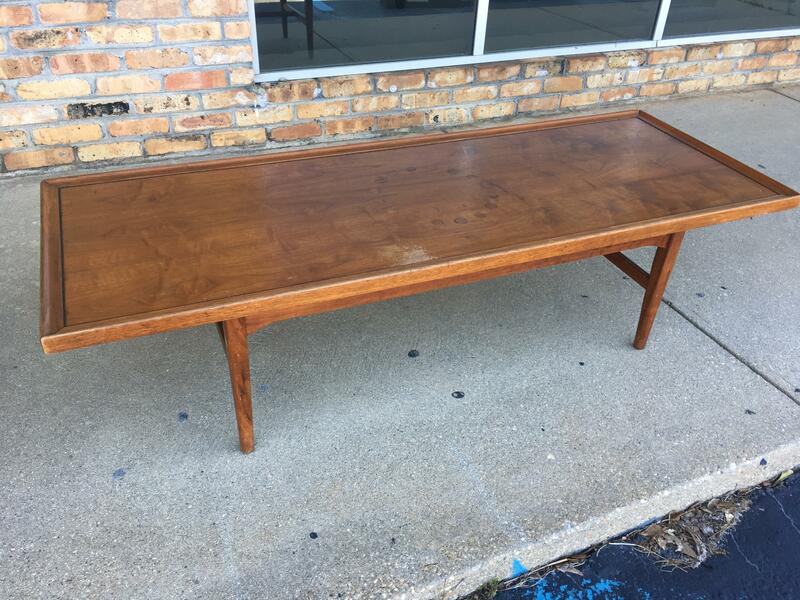 Got myself a gorgeous Garrison Furniture Co. dining table for $25 at goodwill today! 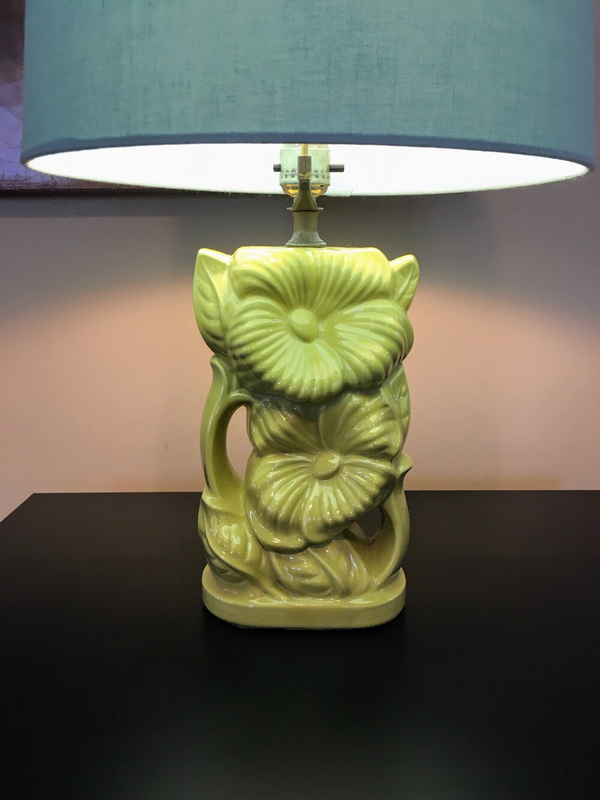 Does anyone know who made this lamp? Only markings is J-2092 on the bottom. 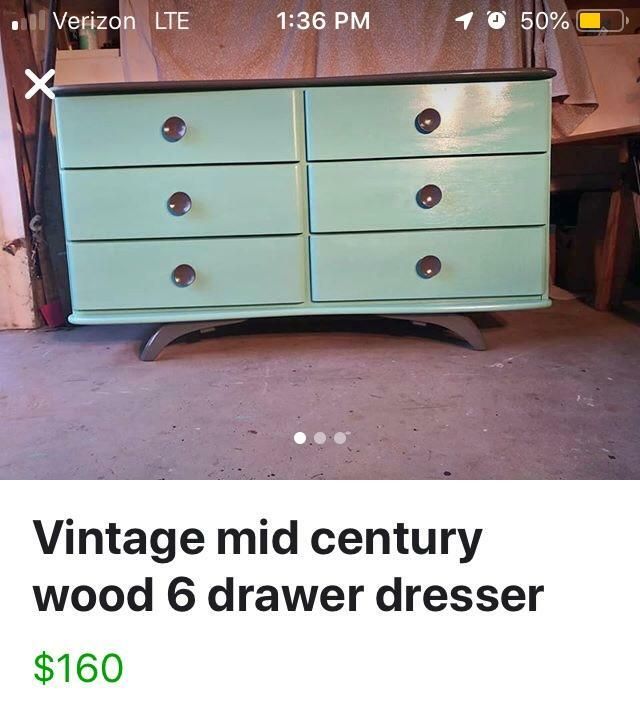 Unique MCM dresser. Make is unknown. Has anyone seen this before or knows anything about it? 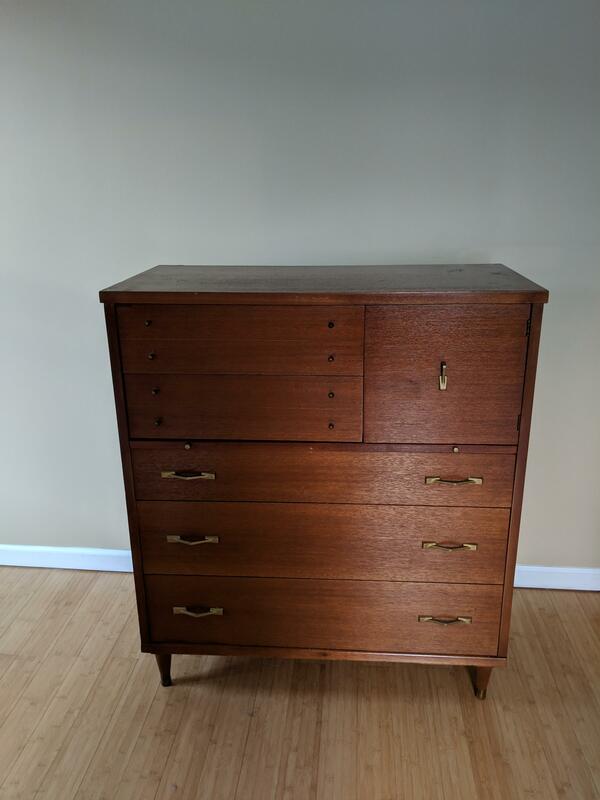 Heywood Wakefield dresser I picked up for $200. It’s from 1961 and I’m near perfect condition. What do you think? 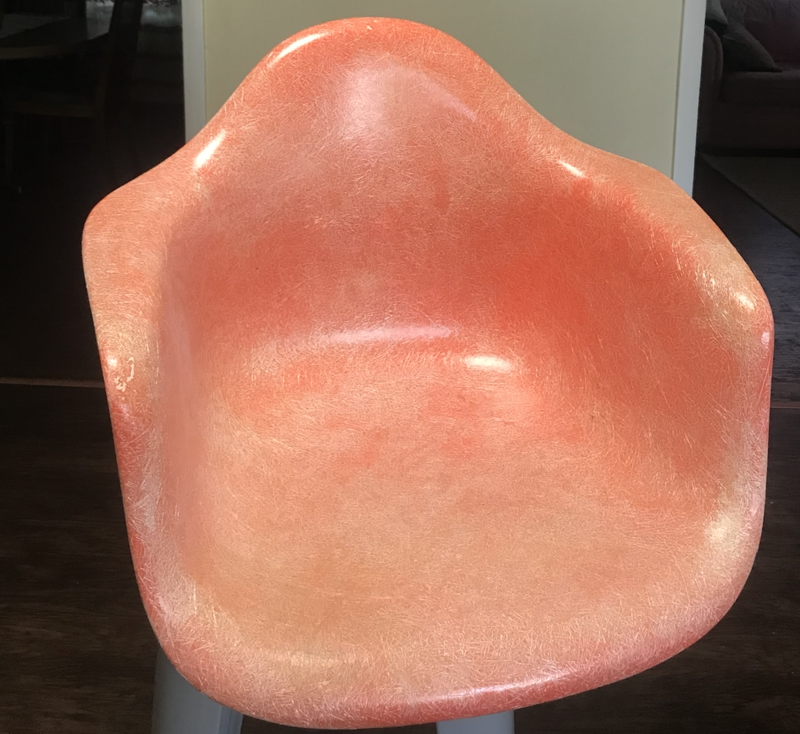 Almost Finished Restoring Eames Rope Chair - Sealer Recommendations? 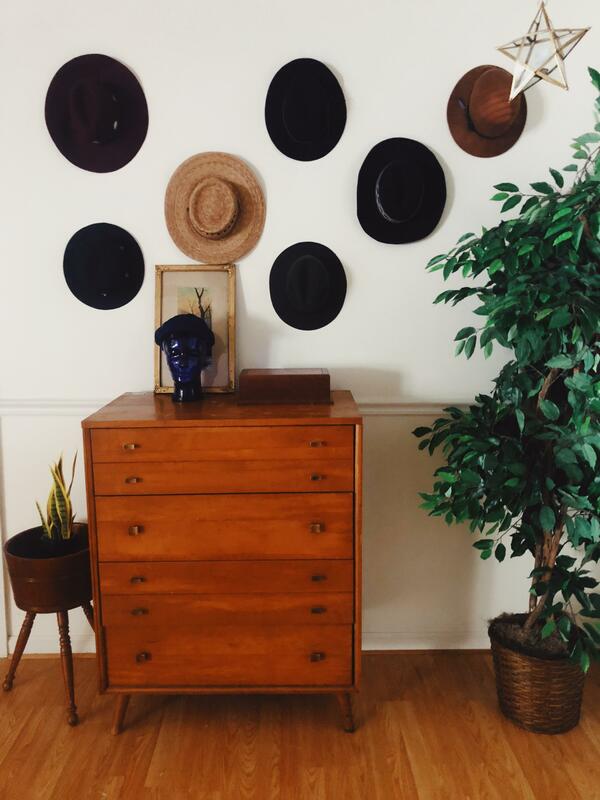 Made my first mcm thrift purchase today!! Real Leslie Diamond or nah? Made in Melbourne, Australia 1963. I'm not sure if this is crap because its well made and by hand. Came with the house. Any help? Unique Lane table markings. Used to the burned in info, but I also have a stamped separate set over the top in ink? Any help with an explanation friends? 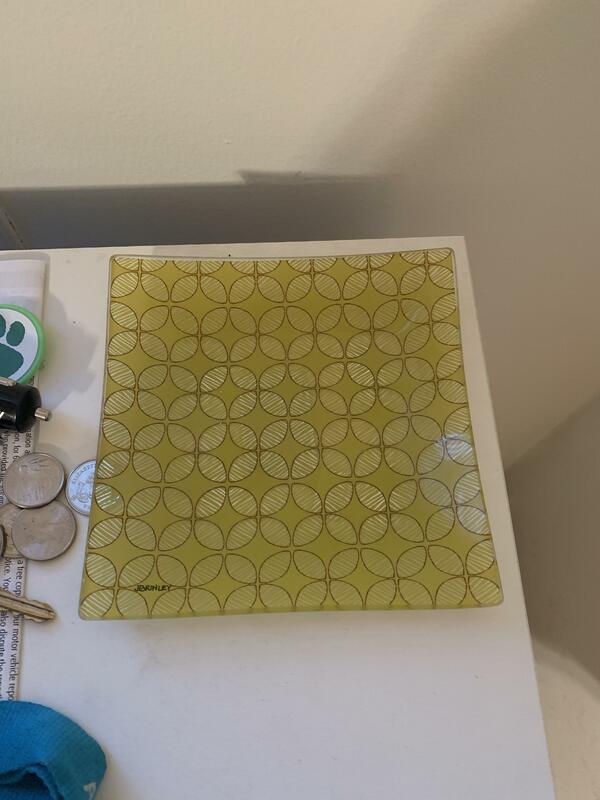 Coworker selling, what should I offer? 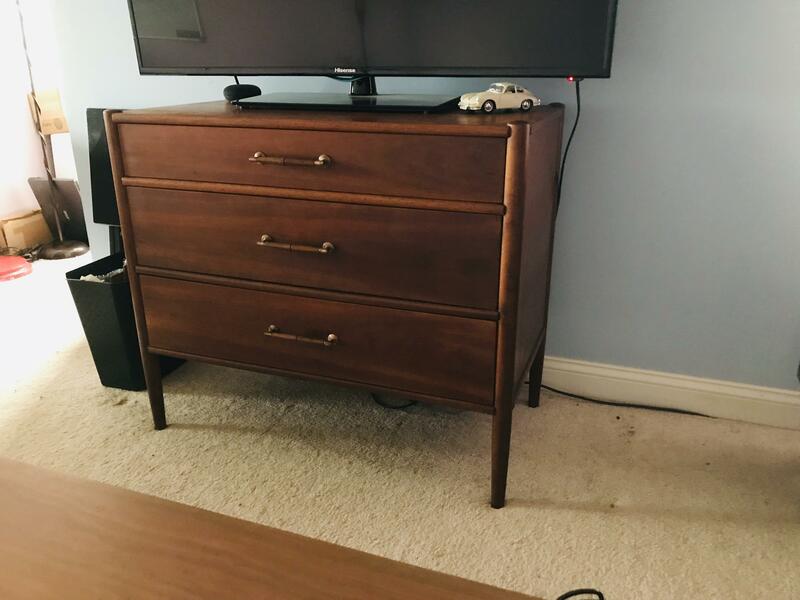 Dresser I picked up for $4.00 on half off day at Goodwill. Stripped, restained, and fixed a broken leg and good as new. No Makers stamps just a tag with im gonna guess whoever bought it on 10/2/69. 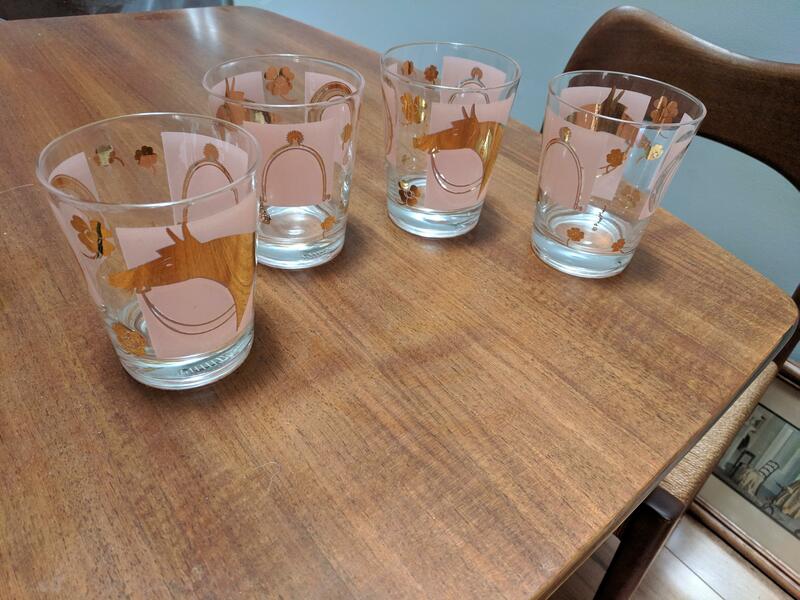 When you binge buy so much MCM glass you trip the fraud alert at your bank. 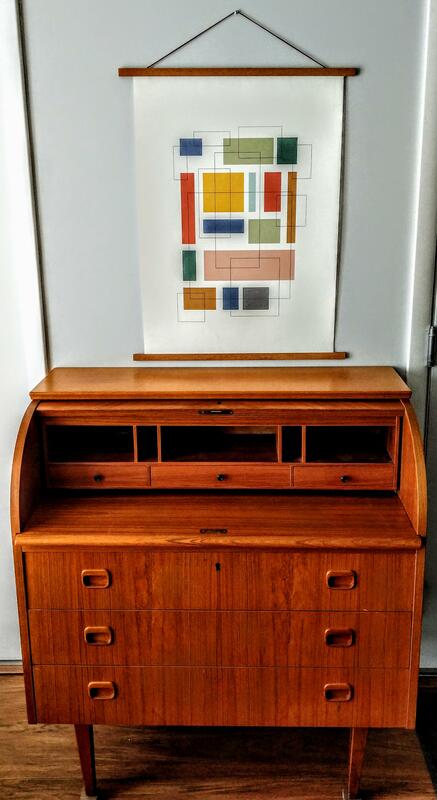 Bought this beautiful piece yesterday for $75! 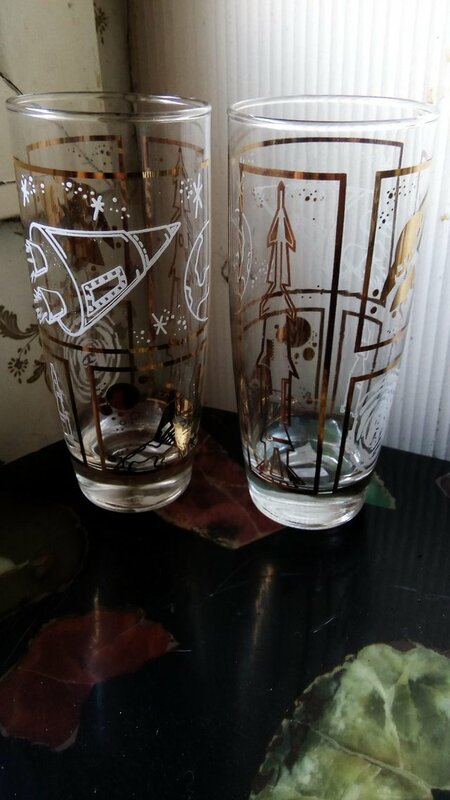 Can anyone tell me if these are true Mid Century or just reproductions? Thanks! 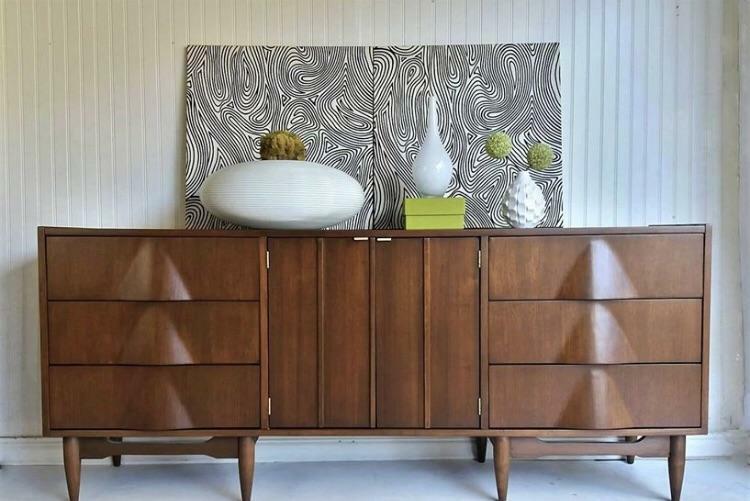 Is it a massive MCM feaux pas to have a credenza without feet/pegs? Is this worth $50? 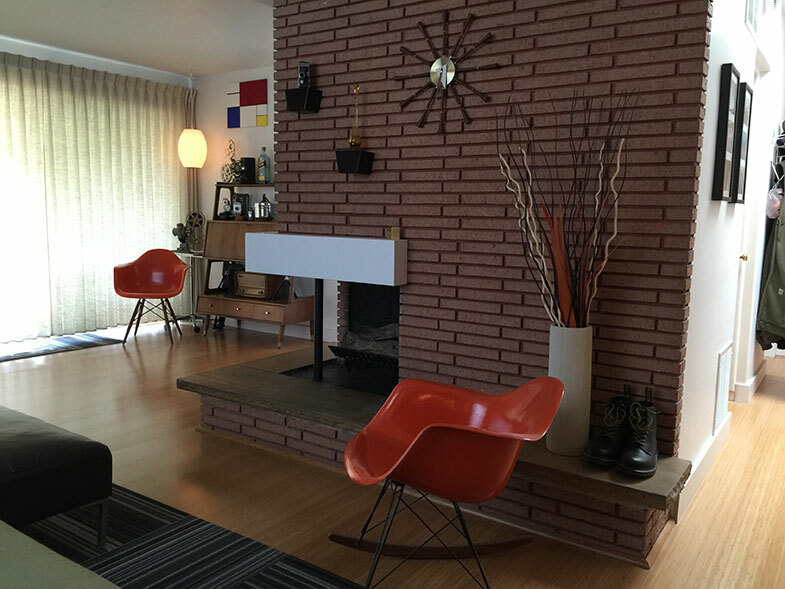 New to the mid century game. 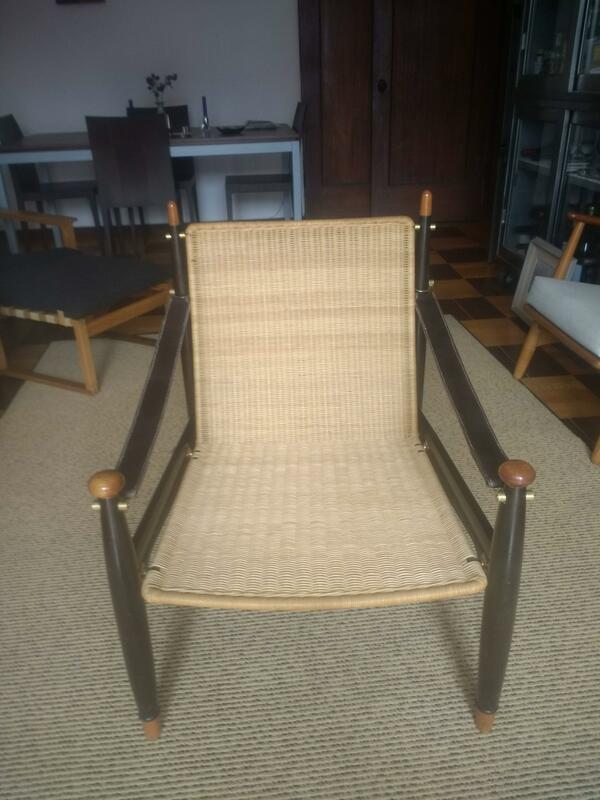 Can Anyone Help me ID this Chair? It's a set of two. 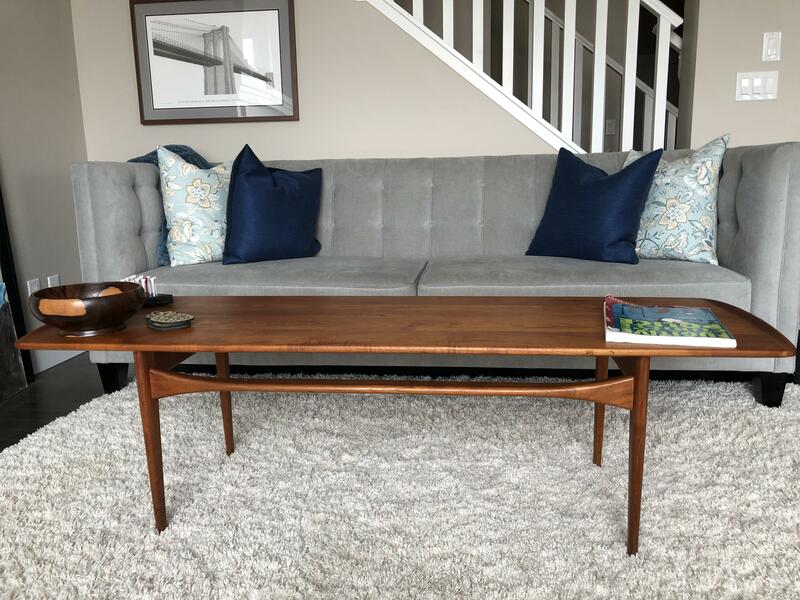 Both are painted and the cushions don't look original, seller asking $100. Think they're worth it? 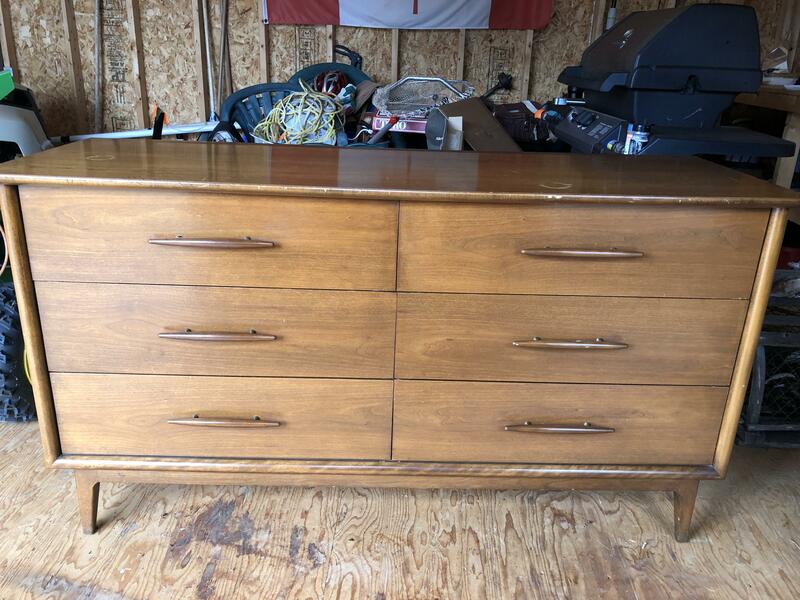 Pick up this beautiful Gibbard dresser the other day. 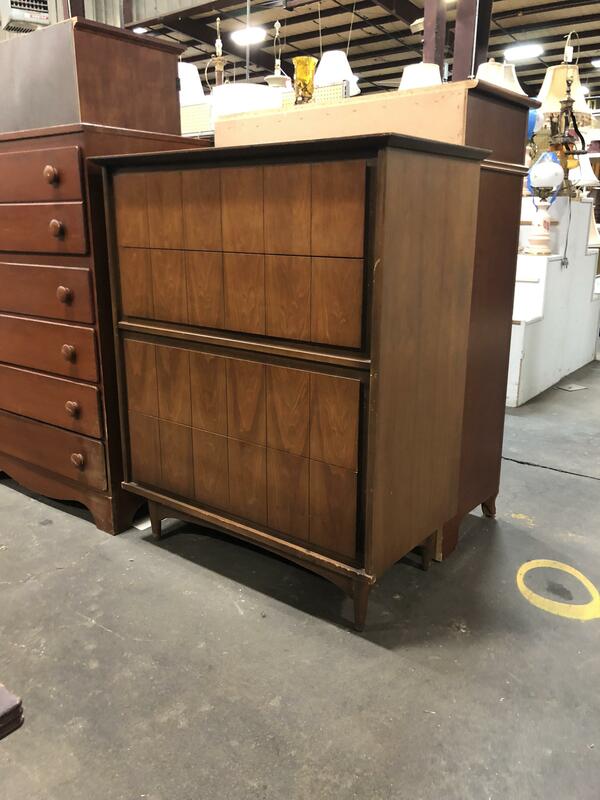 Looking forward to refinishing it. Does anyone recognize this? Is it worth $80?? 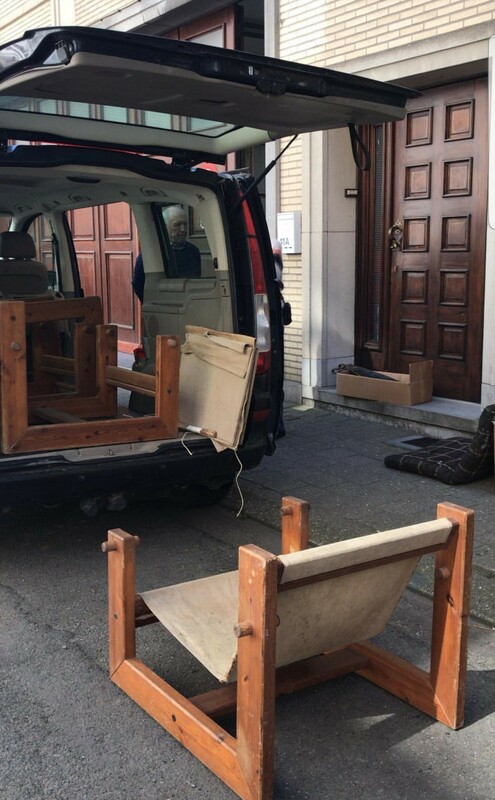 Spotted this couch frame at the donation drop. 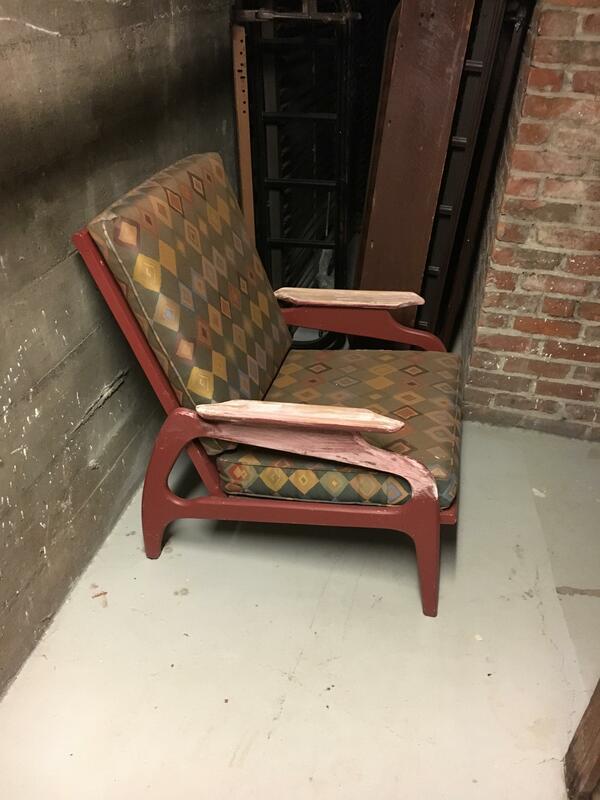 Where can I find replacement seat/back cushions and is it worth saving? 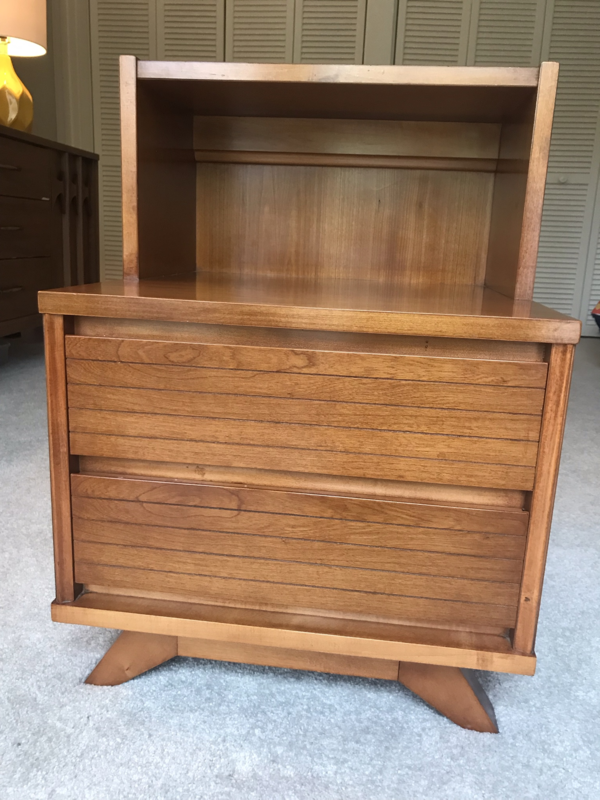 Curious about maker and year of this estate sale find nightstand. More photos in comments. Posting a better pic. Recently refinished this piece I got last week. I love it! 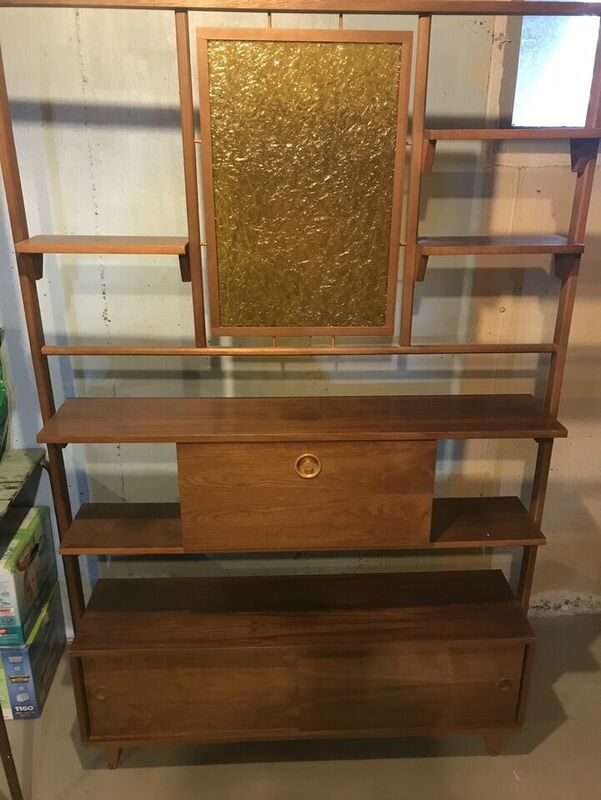 Purchased this shelf for $225 today! Are renders allowed here? I’ve been obsessed with the design style for a while, but I can’t afford to buy any of it at the moment, so I made my own! 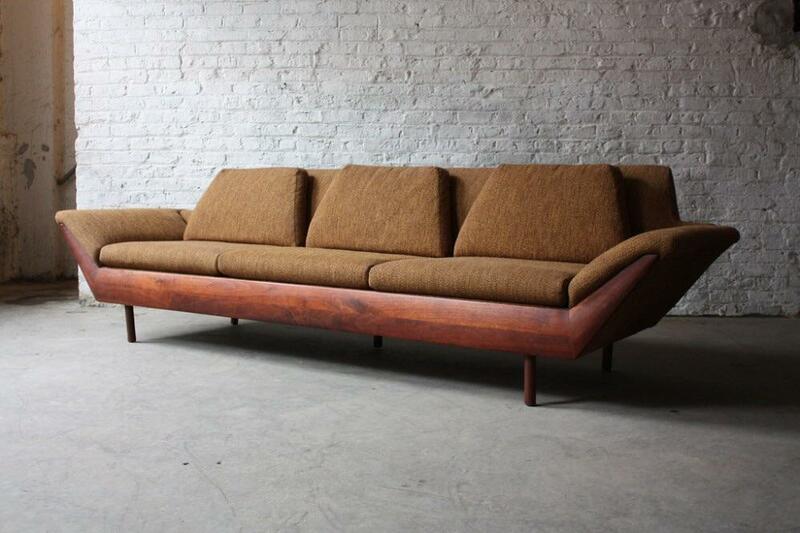 I modeled and rendered this couch using Blender. Edited with VSCOcam (LV1) to give it a classic film look. 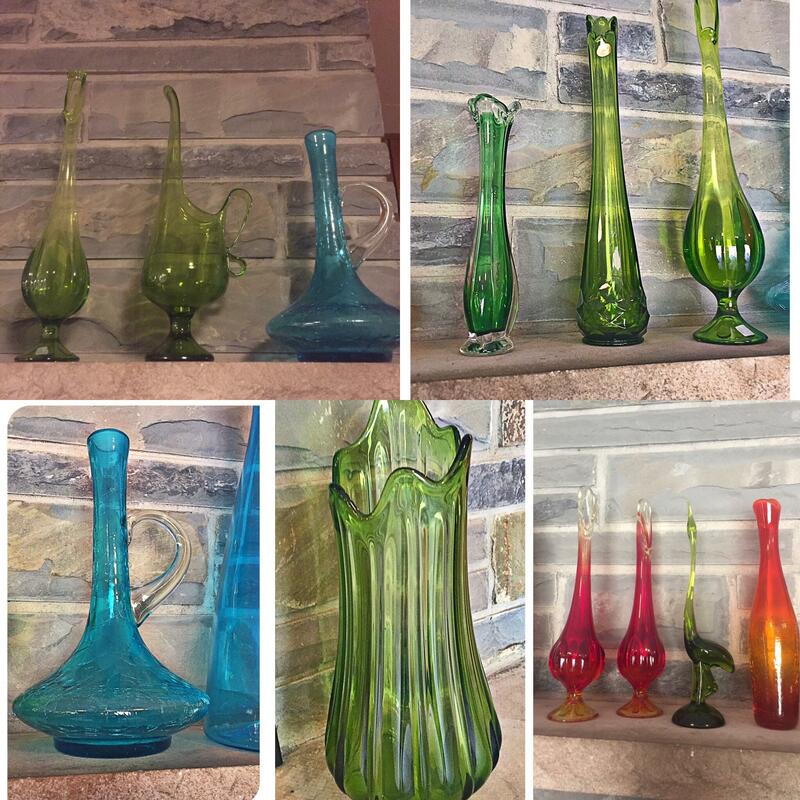 For those of you that sell your finds, what are some tips? Just bought Tomlinson table, 6 chairs, buffet, & cart. Can I split up and sell some or is it best to keep together? Found this Drexel “declaration” coffee table by Kipp Stewart today while out thrifting. 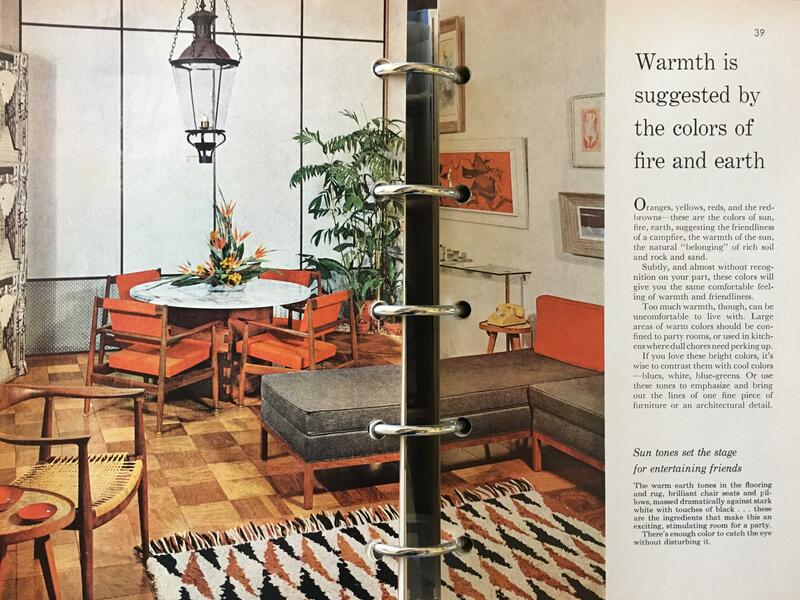 One of my favorite rooms from the 1961 Better Homes and Gardens design guide. Finished restoring this Brasilia I found last week. Stripped, sanded, toned and lacquered. 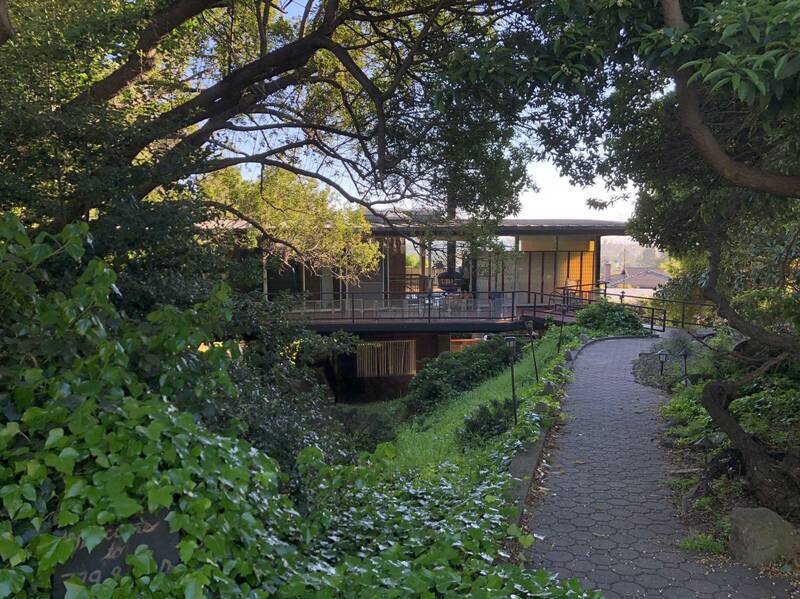 Ready to take on another 50 years! Now to start on the mirror.. Recent find. Anyone got an idea about who the designer might be? $20 dollar Facebook market find. Third piece of Brasilia found in the last two weeks! 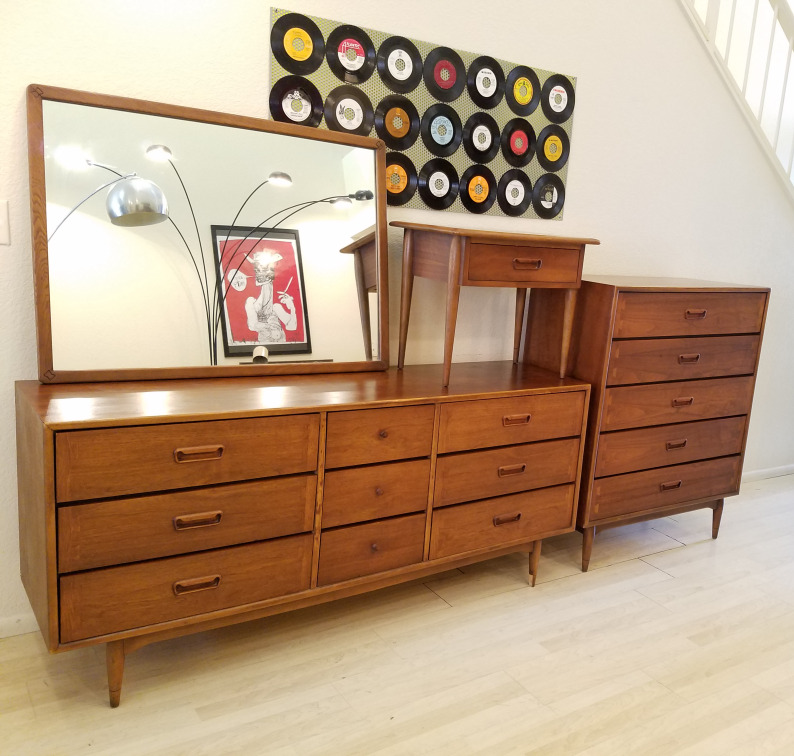 Is this a Pinterested MCM piece? I'm too new to tell what it could be underneath. FB marketplace listing. 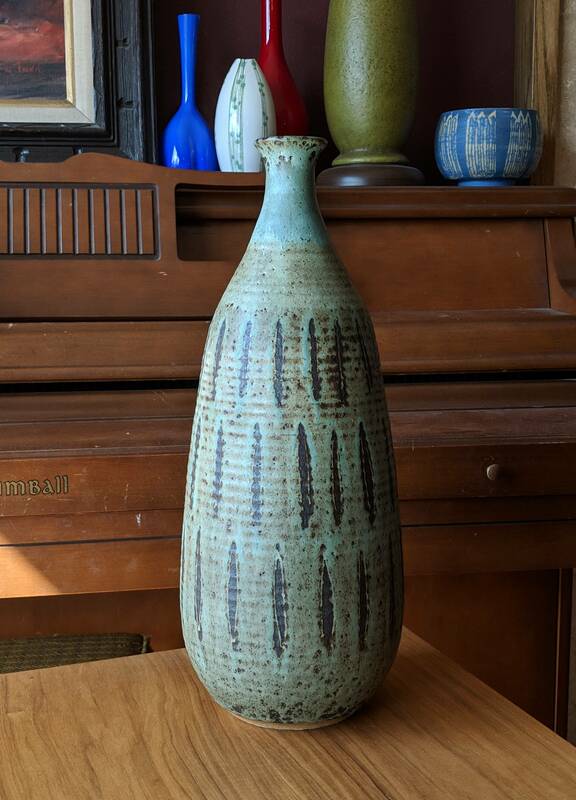 I recently found this fantastic studio pottery piece by Abraham Cohn dated 1964. He was a respected and influential Wisconsin Potter that had studios in Milwaukee and Fish Creek (Door County). 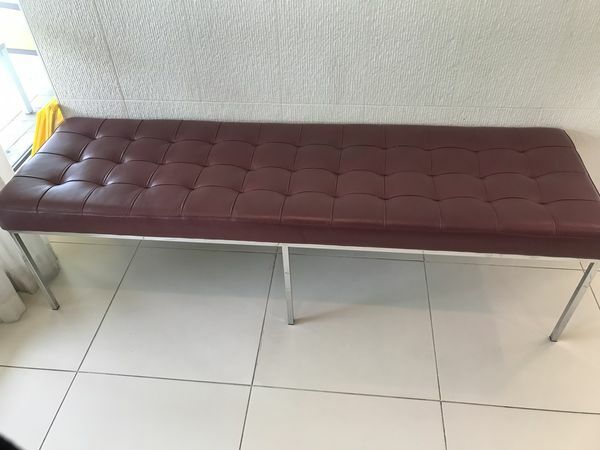 An authentic Knoll bench? 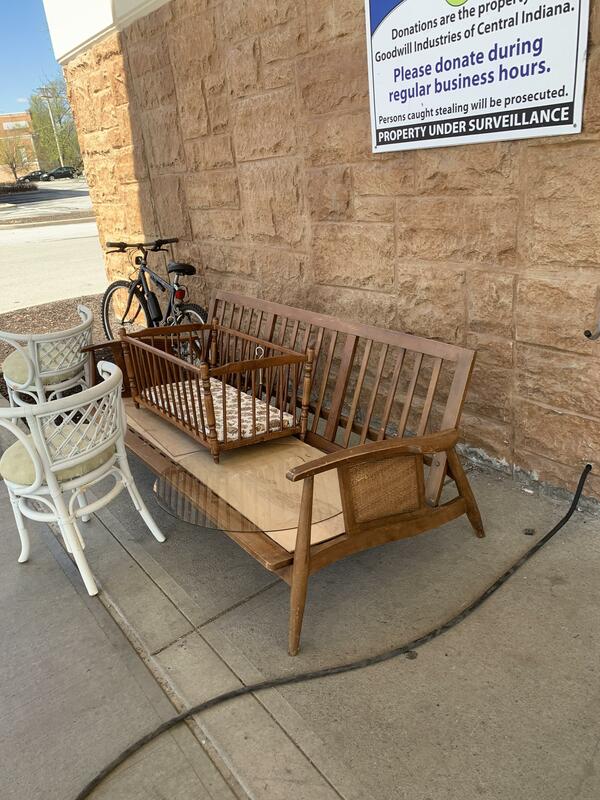 Haven't seen an example of a three-seat bench with a single cushion. Thoughts? 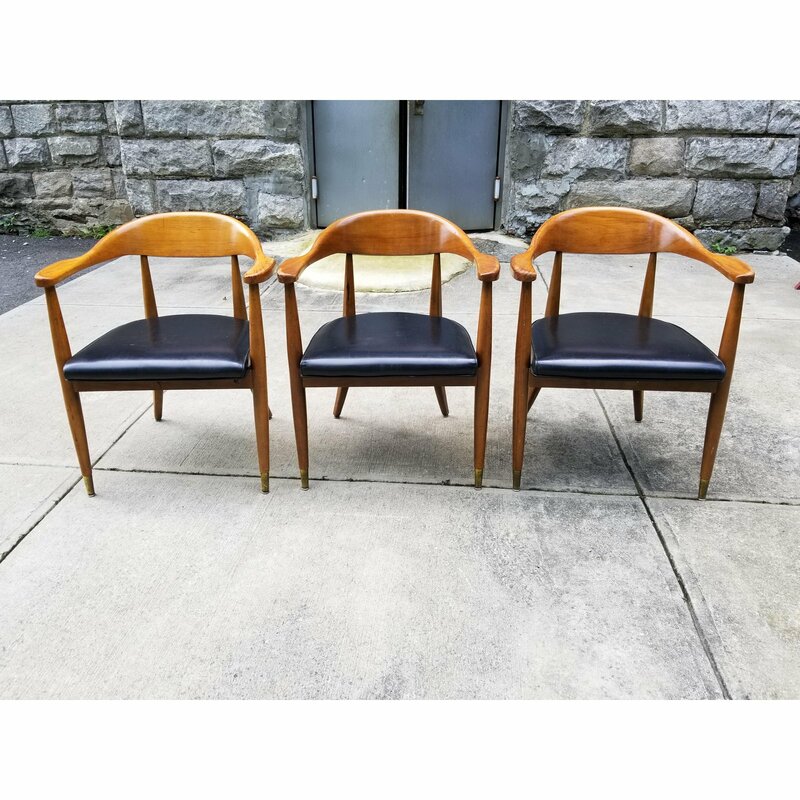 Help ID'ing these curved wooden mid-century chairs I picked up on FB marketplace? Only identifying thing was number on the bottom.. Picked up for 99 cents. Has an Orla-Kiely-esque Pattern. Mark says JBrinley but images on google don’t look anything like this. Anyone know anything about it? My first piece of MCM (freshly oiled), now on to the next! 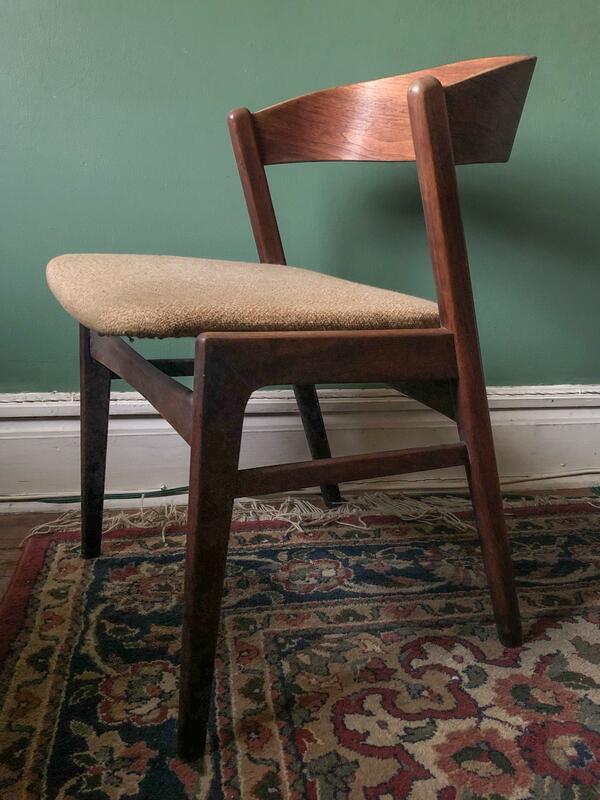 Snagged a set of four of these suspected MCM dining chairs from the trash. They’re in near perfect condition, and I’m in love with them! Although with no makers mark to be found, I’m looking for some insight on their history. 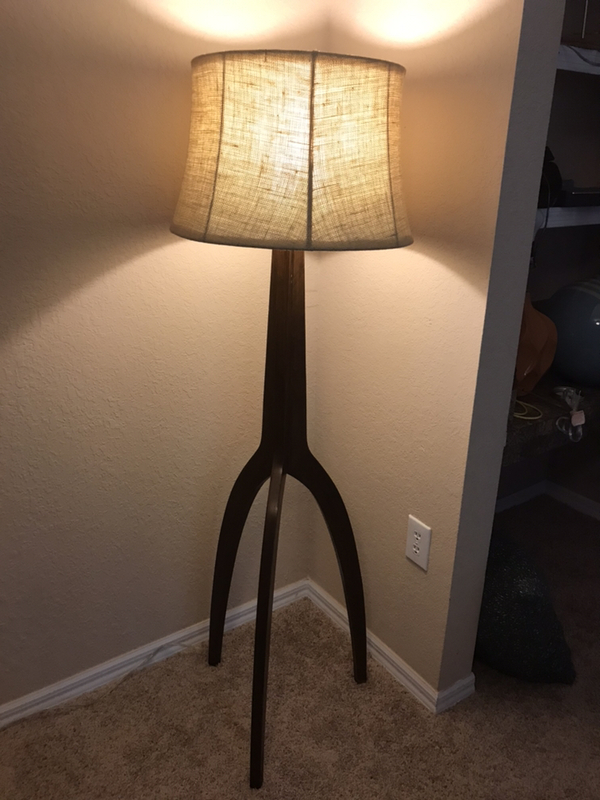 Need an ID on this lamp. Trying to find it a sibling in another color.